Make.Shift & the Pickford invite you to create a movie poster of your favorite sci-fi movie for our summer exhibit: Close Encounters, the unseen editions. See full details, including artwork requirements, here. Look! Our sweet new promo video! Thanks to WWU’s 2014 graphic design BFA students for creating this beautiful video showcasing all the great stuff that happens at Make.Shift! From the artist: My work is aesthetically inspired by the vintage comics I used to pore over as kid. Thematically, I am either trying to express something with a social / political message or creating something that appeals to my somewhat eccentric outlook on life. With this show for Make.Shift I just wanted to have fun with the work. I enjoy showing in galleries but am also very interested in street-art and the inclusive nature of showing work in a public space outside the curatorial confines of a commercial environment. Seeking Vendors for 2013 Holiday Make.Sale! Believe it or not, the holidays are right around the corner & Make.Shift is looking for vendors for the 2nd annual Holiday Make.Sale. Make awesome stuff? Want to sell said awesome stuff at the coolest DIY craft sale in town? Well, apply for goodness sakes! This year, will be a one day only event on Saturday, December 14th. Check out the Application for details. Submit your application & sample images by October 20th to be considered for this year’s event! Come make films! Saturday, June 29th and July 6th, 1-4pm. $60 for hands-on instruction, a camera for a week, film, developing chemicals and more. 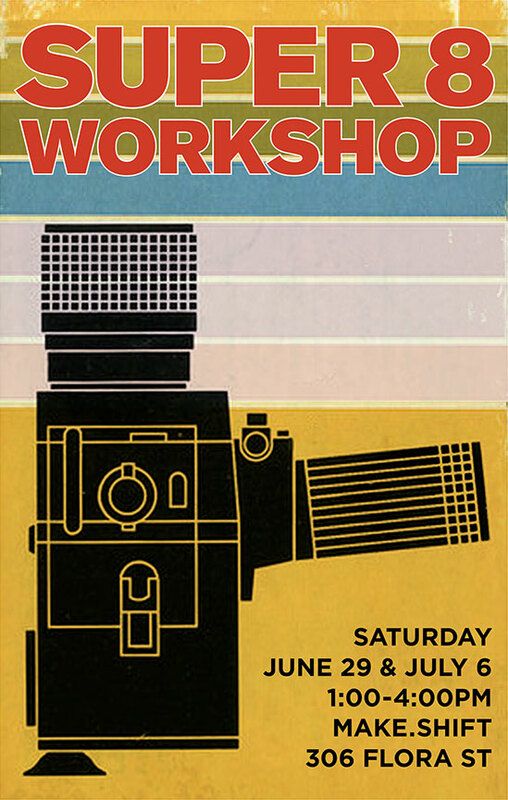 First session (June 29) will include an introduction to the medium, a crash course in cinematography, and then hands-on time with Super 8mm cameras. You get to take the camera with you for the week and shoot your film. The second session (July 6) will be hand-developing the film, then projecting everyone’s films. Only 10 spots are available, so sign up quickly. Click here or the button below to use paypal to purchase your slot.